Grow apple trees if you live in U.S. Department of Agriculture growing zones 3 to 10. 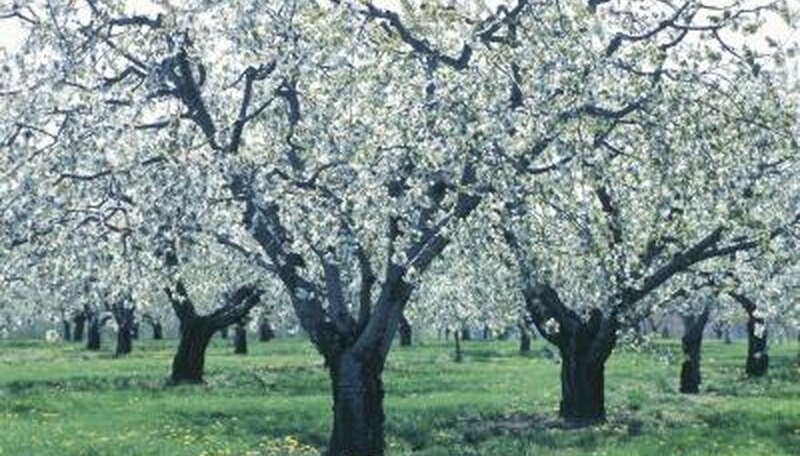 They are among the hardiest of fruit trees, very adaptable to heat and cold, and provide plenty of fruit for their first 25 years, tailing off as the trees age. Keep in mind that apple trees are pollinated by wind and insects, so more than one cultivar must be planted in order to get a crop. Like all fruit trees, apple trees can be susceptible to frost damage during critical bud, bloom and fruiting stages. Watch weather forecasts for frost warnings in early April, when buds develop on apple trees. Sustained temperatures below 32 degrees Fahrenheit cause frost to develop on tender leaf tissue. Damage may be seen 1/2 hour after frost melt, and includes curling, browning or blackening of buds. According to the University of Missouri Extension, tissue death occurs when ice crystals form in the water inside plant cells, causing them to rupture. Mid to late April is another critical point of development, when apple trees burst into bloom. A late-spring frost, accompanied by sleet, destroys delicate flowers in the same manner as frost kills buds. Consequently, no fruit will develop that year. If enough ice accumulates along with frost, limbs may break. Prune damaged branches back to the trunk, taking the whole limb, not just trimming off broken ends. Watch for frost damage in early fall, when late-fruiting apple cultivars are still ripening. Though fruit can survive a single night of frost, several nights will be a problem. As ice develops inside the flesh and skin of the fruit, crystals burst cell membranes. Fruit will soften, turning mushy and brown as daytime temperatures rise. It's the same as if you froze an apple in the freezer and then set it out on the counter to thaw. Plant apple trees on a gentle downward slope if possible. This funnels cold air down and away from trees during a cold snap. Several sustained nights of extremely cold weather and strong winds can damage trunk bark. As wind evaporates moisture from thawing frost, it dehydrates the bark, causing it to split, particularly when apple trees are very young. If you can't plant them on a slope, place white plastic guards around apple tree trunks to shield them. In addition, the white surface will reflect winter sunlight that also causes dehydration and cracking.